We’d love your help. Let us know what’s wrong with this preview of Stop Being Lazy by John Sonmez. Isn't it about time you stopped being lazy and took back control over your life? I used to be lazy. Extremely lazy. But, just this last week, I ran 50 miles, did 3 weight training workouts, attended kickboxing classes and got a ton of work done, making a nice big fat paycheck. You see, I learned how to overcome laziness--and you can too. This book is a nice short read (just 54 pages), designed for you to learn the secrets of going from lazy to self-disciplined and productive. Deep down, you know that you are meant to live a life better than the one you’re living right now. You know that you are capable of doing, having, and being so much more—but you’re too damn lazy to experience who you truly are at your core and having what you’re really worth. I know how you feel because 8 years ago, I was in your shoes. I was lazy, overweight, filled with fear, and living WAY below my potential. If you’re really ready to give up laziness, I’ll show you how I did it and how you can too. To ask other readers questions about Stop Being Lazy, please sign up. I will admit up front that I am likely not the target audience for this book. 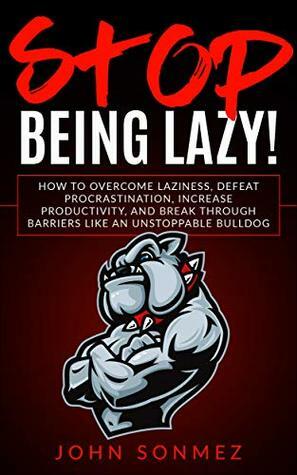 The book takes a simplistic view of life where everyone is either lazy and pathetic or a “bulldog” and super driven. While it makes an occasional nod to using your talents to help others, overall the message is extremely self-centered and feels a little shallow. Is there no value in contentment? Do I constantly need to be climbing a mountain to experience happiness? Is there no value in enjoying quiet moments of life or *gasp* watching or listening to something for entertainment? Awesome quick read. John never disappoints. Love the book. Picked up the audio version to as well because I got a lot of extra content from listening to "The Complete Software Developer's Guide". I really like personal development so if you are looking for a quick read to help get you motivated to change your life, this is a good pick. This book goes a lot further than prescribing a cure for laziness - it reads as a call to action to transform your life, and seems directed at someone a lot more dissatisfied with their current state of affairs than me. Nonetheless, it was mildly inspiring and I learnt some new things (eg pomodoro time tracking). Stop being lazy, is perfect for the lazy in you! Personally, I need motivation and reminders when it comes to procrastination. Stop Being Lazy is perfect if you have fell off track, or if you need to get on track. Highly recommend this book to anyone looking for sound principles and techniques to crush laziness. A very quick and easy read. Mildly motivating, even if it's devoid of actual content. Energetic, inspiring amd practical. You won't be disappointed on giving it a read.